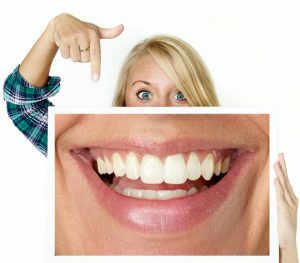 Porcelain veneers are custom-made shells of porcelain bonded to the front surface of your teeth to provide a beautiful new smile correcting the unique problems you may have with your teeth. Veneers can match the shape, size, color, and translucency of your teeth or can be a lighter shade so your smile is whiter than before! Veneers are durable and stain resistant and with proper care they can last many years! If you are interested in porcelain veneers, consider scheduling a complimentary consultation with Dr. Kostides! During your initial consultation, Dr. Kostides will evaluate your teeth and determine if this is the best option for the results you desire. If it is determined that porcelain veneers are the best solution for you, Dr. Kostides will prepare your teeth for the procedure; which consists of removing a small amount of tooth enamel from the front of your teeth thinner than that of a contact lens. An impression is taken of your teeth and sent with specific instructions to a specialized dental lab where the porcelain veneers are created. 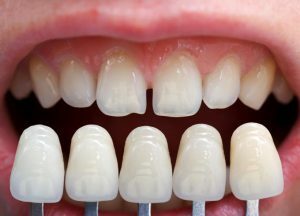 While they are being fabricated, you will be fitted with temporary veneers. 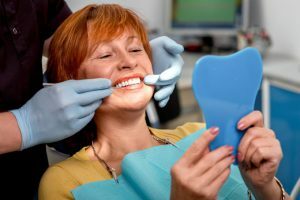 Many people find their temporaries to be such an improvement that they are ecstatic once their custom-made porcelain veneers are bonded to their teeth. It will take 2-3 weeks for the porcelain veneers to be created, and Dr. Kostides will inform you of when they arrive. Once you approve your new porcelain veneers, Dr. Kostides will bond them to your teeth. This is performed with a special bonding agent that is brushed onto your teeth. Then, the porcelain veneers are placed onto your teeth and a high-intensity light is directed onto the porcelain veneers, curing the bonding agent and permanently affixing them. Your porcelain veneers will be stain resistant, and, depending on the shade selected, they will provide you with a beautiful white smile for many years. Porcelain veneers are an amazing solution for many different dental problems, providing you with a smile that is straight, even and white! Call us for a complimentary Smile Evaluation!